Porcaro, Sister Dorothy, 87, a Sister of Mercy for 68 years (formerly Sister Marie Dolorata, RSM), died on November 11, 2018 at Mount St. Rita Health Centre in Cumberland. Born in Providence, she was the daughter of the late Charles and Ida (Ciampa) Porcaro. She leaves her two sisters, Marian Landry and Helen Curtis and numerous nieces and nephews. She was the sister of the late Irene, Marcelline and Felix Porcaro. Dorothy, as a Sister of Mercy, taught in many RI elementary schools. One recurring mission was to Holy Ghost School in Providence. 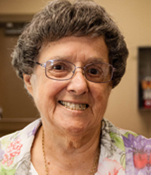 Wherever Sr. Dorothy ministered, she is remembered as making many friends because of her kindness and jovial Italian personality. She treasured her students and her family. Among her nieces and nephews, she was known for her spirit of generosity, making her a candidate for the title “favorite Auntie”. She will be missed by her family and her Mercy Community.